This buffet is exactly as pictured. It is a pretty white and sturdy piece to hold all types of items. The cabinet is actually suitable to place anywhere in the home as well as the kitchen. The product is fairly easy to assemble. I put together by myself in about an hour. I would purchase again. Simplify the storage of fine china and table linens with this Simple Living Montego contemporary buffet. The closed cabinet and open bottom compartment provide multiple storage options, and the top surface lets you set out snacks or side dishes for guests to serve themselves. This contemporary buffet has an antique white finish that meshes well with traditional kitchen or dining room decor. This cabinet fits my tv on top in my room and a ton of storage space inside. I like the open storage at the bottom to display a couple of cute items. Fairly straight forward to put together, I did it by myself and was fine. Hanging the doors was the trickiest part by yourself but not too bad. The color is whiter than it seems in the picture, a nice true white but not too bright. Not the biggest fan of the style of the knobs but they could be changed later on. Overall I am very happy with this purchase and like that the shelf is adjustable inside as well. Great buy! Editing my review after a few months of use, cabinet is holding up well! Great to store extra linens etc in my room. The doors are not the thickest/sturdiest but they are totally fine. Overall still happy! 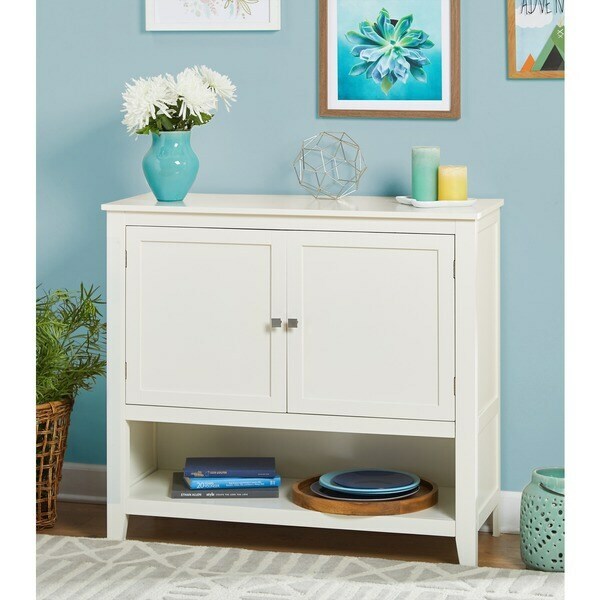 This Simple Living Montego 2-door Buffet came in the exact measurements as advertised and looks exactly as it does in the photos. I have no complaints other than....when you assemble it, have patience and pay close attention to the letters and numbers of each piece and you'll do fine. I had my husband help me put it together and with both of us...it went together in 30 minutes. We made one wrong move with the door hinge. Corrected that and the rest went together great. The color is NOT white...eggshell is more like it in my opinion. Like the buffet a lot and it is perfect in the kitchen for extra storage as we are limited, space-wise. The quality is decent for the price. The only difficulty was in assembling the piece as the instructions are very hard to understand. Granted, my husband and I aren't the handiest of people, but we can usually follow directions. However, these were abysmal. We gave up and had a friend, who is super handy, assemble it. That's my only complaint. I bought this for my son and daughter-in-law. They needed extra counter space. It's great for their microwave. Big plus is the storage for large appliances that aren't used often. They love it. The quality matches the price, looks pretty durable, although the door and back and side panels are pretty thin. Some predrilled holes were stripped.Assembly requires patience and imagination, as the instructions are useless in a lot of places. Wrong size of screws for magnetic closure for doors. The piece keeps falling off. When I replace those with ones that fit better and hold the magnetic piece in place, then I think I will be happy with the purchase. Overall, a nice extra storage and looks good in the kitchen. Overstock shipped the item fast and was delivered promptly. This buffet is of poor quality. Have purchased a variety of items from Overstock over many years. This is the first item that is not of acceptable quality. It is little more than a toy. Not wood, synthetic material, very flimsy and hard to put together. So disappointed - too much trouble to return. Very pleased. We needed a space-saving TV cabinet for a small den, and this fits the bill... attractive, reasonably sturdy, and versatile. Could be used in a variety of settings... dining room, kitchen, or bedroom. Assembling is not too difficult... just requires a little time and patience (and a helping hand now and then). Great purchase! Ordered this buffet for a small nook between kitchen and hall. Was looking for a place to drop keys, purse when entering house, and this serves that purpose but also gives me additional storage. Simple lines, I love it. Received the product and spray painted it white - with no problem. Put it together nicely but noticed the door had a crack in it. Not sure if it was damaged in transit but not worth sending back. Good service and good product. I had read the revies before buying and didn't think they did justice to the product. It is a sturdy product and is great for extra storage. Heavy piece. Not white, more creamy. Used this for extra storage in office area. Looks great. Had a chemical smell but aired out in a few days. Took some time to assemble, and I'm glad I had the patience to backtrack to undo a mistake. It looks polished and attractive and goes with the cottage vibe I was seeking. It's holding a tv sturdily. I love the buffet. It is very sturdy and was easy to put together. Easy to assemble, it works well for what I need it for but not the best quality. I bought two of these for my dining room & love them. The quality is outstanding! Lightweight but has been serving my needs for additional storage perfectly. "Would you at all consider this to be buttermilk in color?" "What is the assembled weight of this item? Is item movable once assembled?" It is not mobile; however it is movable and need two people to move it. The assembled weight is approximately 54 lbs. "Is the back of the buffet finished? Also what is inside depth dimension?" Yes, the back of the buffet is finished and the inside depth is 14.1" deep. Moved to apartment with very limited kitchen storage space. This piece will fit perfectly behind our breakfast bar, providing the additional cabinets needed and look smart as well. Finally! I can unpack and start cooking. "Will the top of this hold a wine rack of 12 bottles?" Hello, kdhpam. This Montego buffet has a total weight limit of 75 lbs. This buffet may hold 12 bottles, depending on the size and weight of each bottle. I hope this information helps. Thank you for making Overstock.com a part of your day! l.b. "how much weight per shelf including the top shelf? Can rolling wheels be put on this? If so how much weight per shelf and how much weight on the top?" Hello 2taylor2, thank you for your inquiry! The top Shelf is able to hold 35 lbs and the bottom shelf can hold 35 lbs. No, we do not advise making changes to the product. I hope this helps. Happy shopping! My shelves are loaded so they hold a lot! "Is there a vertical dividing piece between the two doors or is the whole space open?" Hello norton4, the whole space is open. Have a great day! The whole space is open.